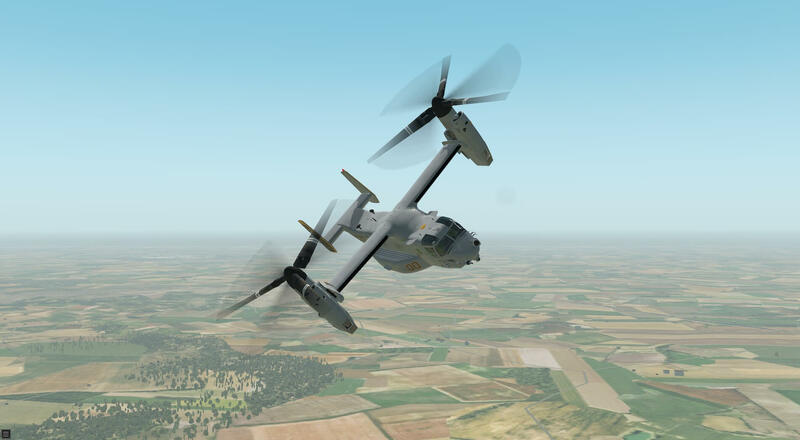 Information provided by Wikipedia explains that the Bell Boeing V-22 Osprey is an American multi-mission, tiltrotor military aircraft with both vertical takeoff and landing (VTOL), and short takeoff and landing (STOL) capabilities. 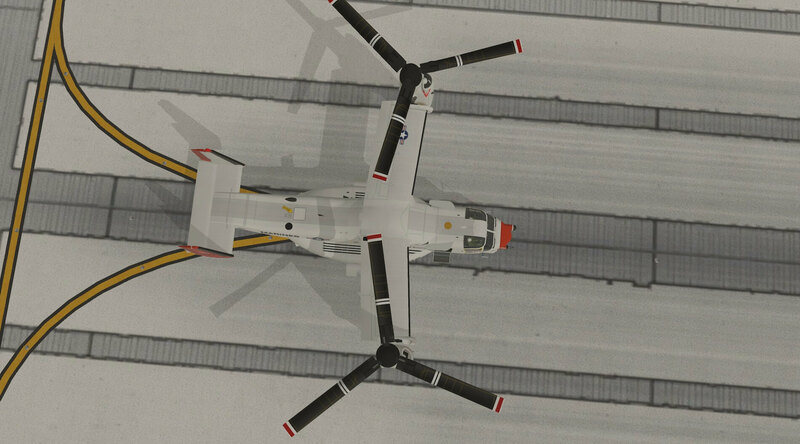 It is designed to combine the functionality of a conventional helicopter with the long-range, high-speed cruise performance of a turboprop aircraft. 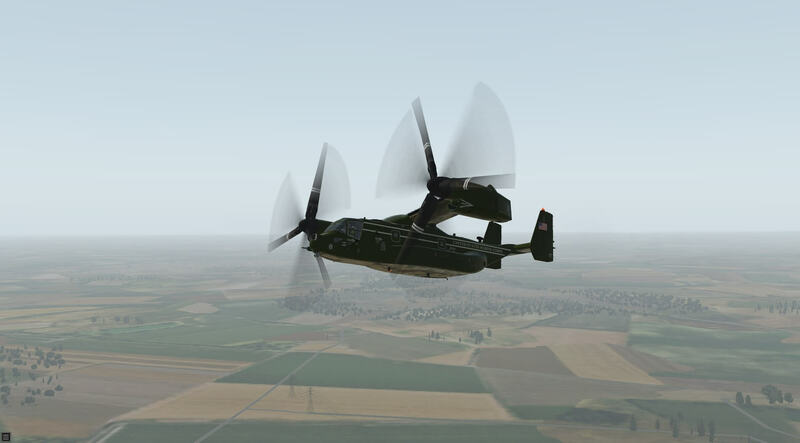 The Osprey is the world’s first production tiltrotor aircraft, with one three-bladed proprotor, turboprop engine, and transmission nacelle mounted on each wingtip. 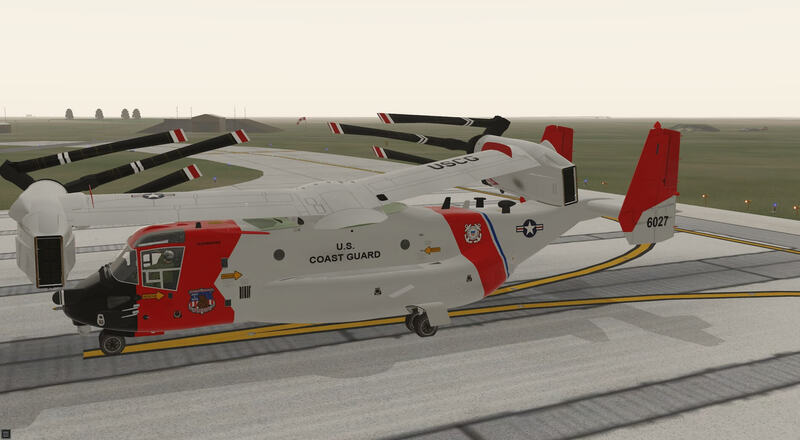 It is classified as a powered lift aircraft by the Federal Aviation Administration. For takeoff and landing, it typically operates as a helicopter with the nacelles vertical and rotors horizontal. 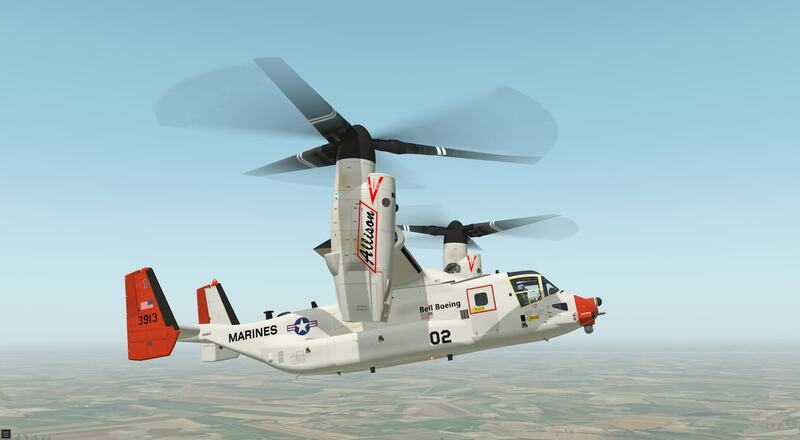 Once airborne, the nacelles rotate forward 90 degrees in as little as 12 seconds for horizontal flight, converting the V-22 to a more fuel-efficient, higher speed turboprop aircraft. 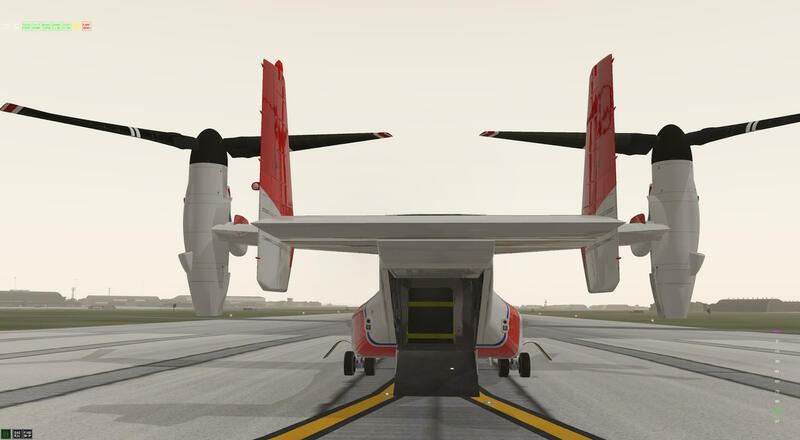 STOL rolling-takeoff and landing capability is achieved by having the nacelles tilted forward up to 45 degrees. It has a ferry range of over 2,100 NM and its operational range is 1,100 NM. The U.S. Department of Defense began the Joint-service Vertical take-off/landing Experimental (JVX) aircraft program in 1981, under U.S. Army leadership. 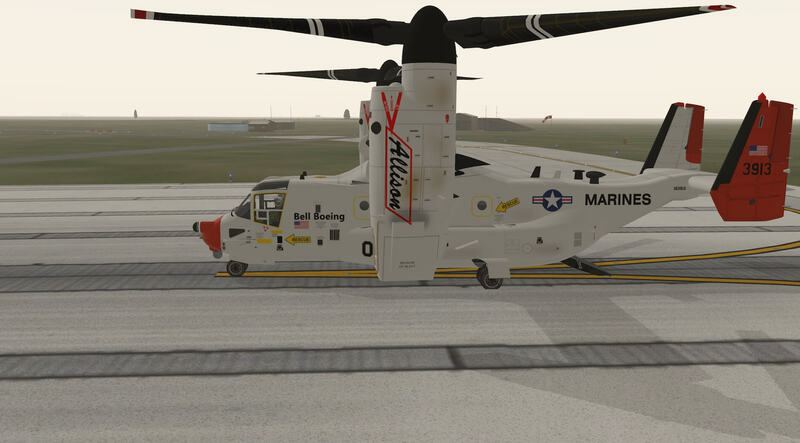 A partnership between Bell Helicopter and Boeing Helicopters was awarded a development contract in 1983 for the V-22 tiltrotor aircraft and the Bell Boeing team jointly produce the aircraft. The JVX aircraft was designated V-22 Osprey on 15 January 1985; by that March, the first six prototypes were being produced. Work has been split evenly between Bell and Boeing. Bell Helicopter manufactures and integrates the wing, nacelles, rotors, drive system, tail surfaces, and aft ramp, as well as integrating the Rolls-Royce engines and performs final assembly. Boeing Helicopters manufactures and integrates the fuselage, cockpit, avionics, and flight controls. 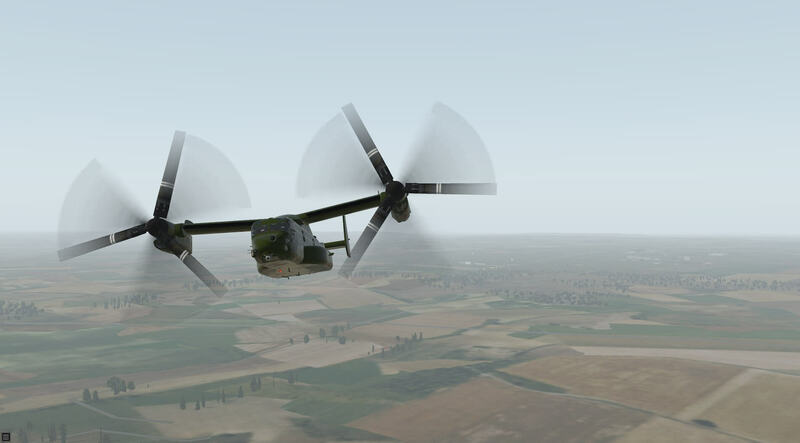 V-22 first flew in 1989, and began flight testing and design alterations; the complexity and difficulties of being the first tiltrotor for military service led to many years of development. 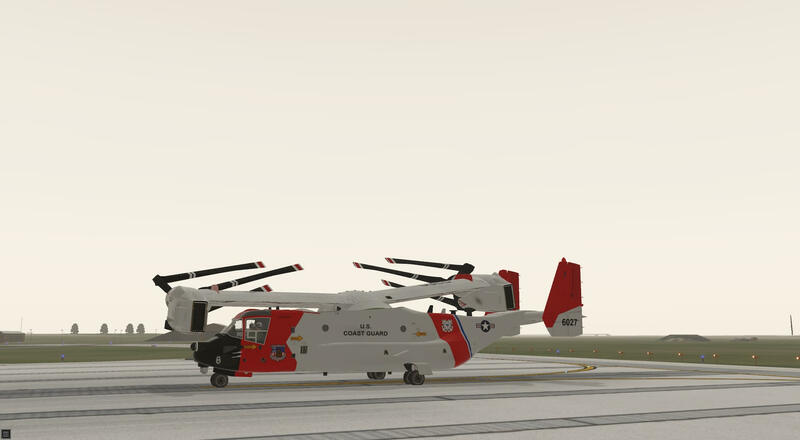 The V-22’s development process has been long and controversial, partly due to its large cost increases, some of which are caused by the requirement to fold wing and rotors to fit aboard ships. Between 2008 and 2011, the estimated lifetime cost for maintaining the V-22 grew by 61 percent, mostly allocated to maintenance and support. 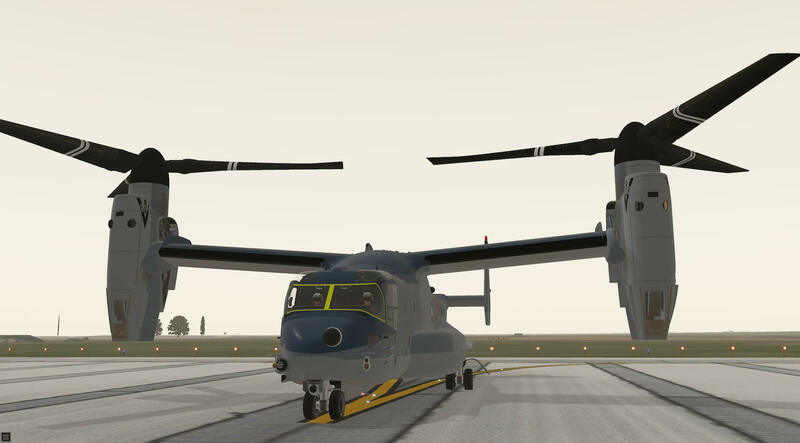 The V-22’s production costs are considerably greater than for helicopters with equivalent capability—specifically, about twice as great as for the CH-53E, which has a greater payload and an ability to carry heavy equipment which the V-22 cannot, an Osprey unit would cost around $60 million to produce, and $35 million for the helicopter equivalent. 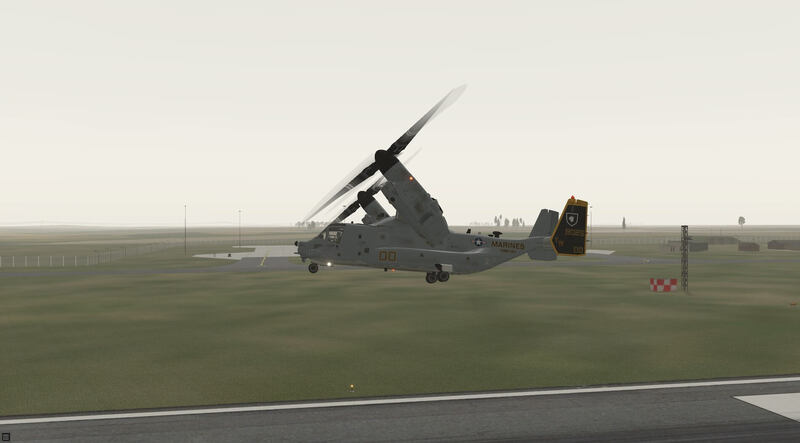 The United States Marine Corps began crew training for the Osprey in 2000, and fielded it in 2007; it supplemented and then replaced their Boeing Vertol CH-46 Sea Knights. 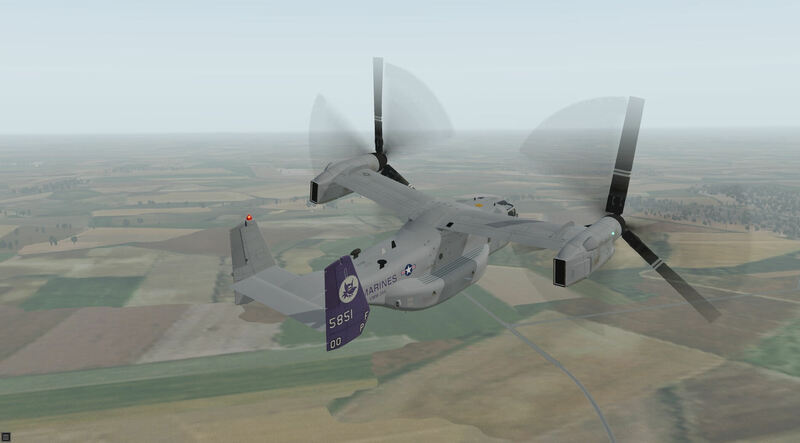 The Osprey’s other operator, the U.S. Air Force, fielded their version of the tiltrotor in 2009. Since entering service with the U.S. Marine Corps and Air Force, the Osprey has been deployed in transportation and medevac operations over Iraq, Afghanistan, Libya and Kuwait. Composite materials make up 43 percent of the airframe, and the proprotor blades also use composites. 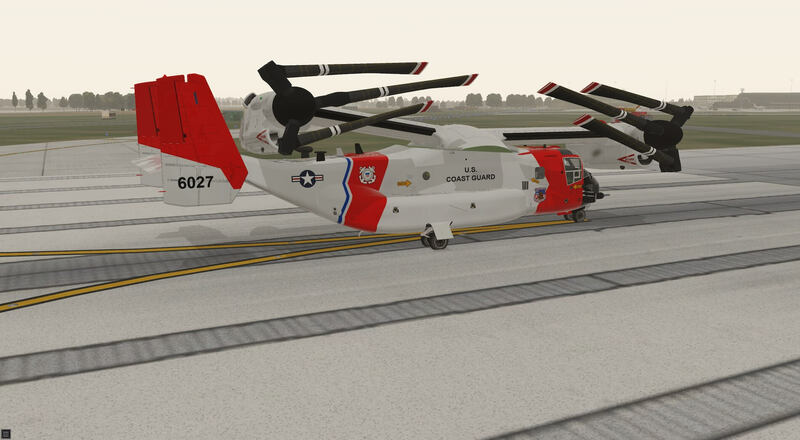 For storage, the V-22’s rotors fold in 90 seconds and its wing rotates to align, front-to-back, with the fuselage. 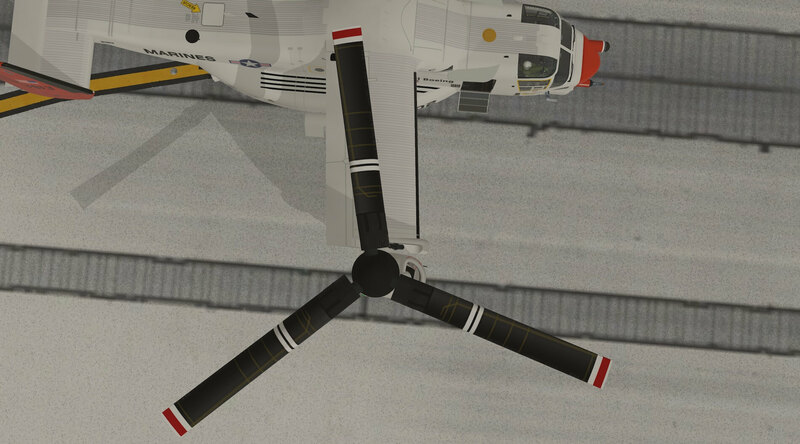 Due to the requirement for folding rotors, their 38-foot diameter is 5 feet less than optimal for vertical takeoff, resulting in high disk loading. Most missions use fixed wing flight 75 percent or more of the time, reducing wear and tear and operational costs. 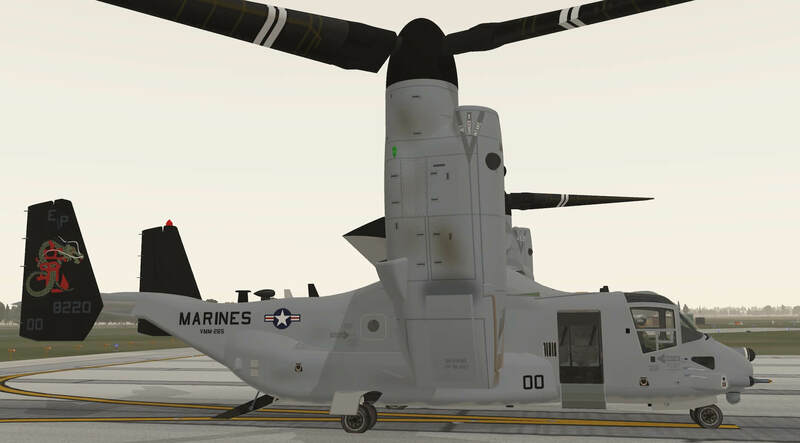 The V-22’s two Rolls-Royce AE 1107C engines are connected by drive shafts to a common central gearbox so that one engine can power both proprotors if an engine failure occurs. Either engine can power both proprotors through the wing driveshaft. 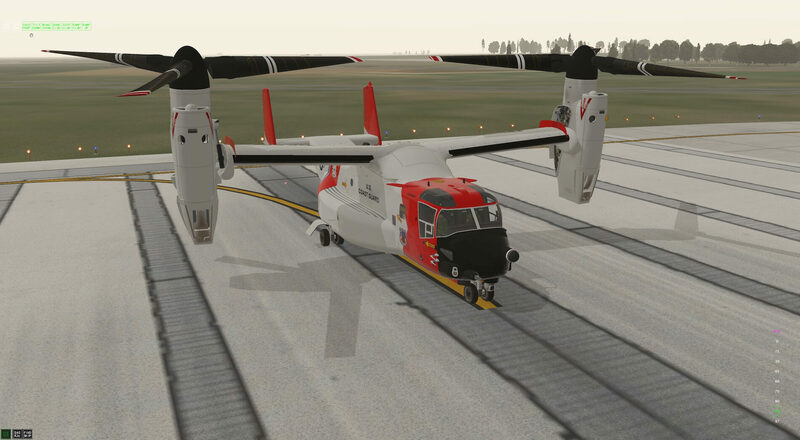 However, the V-22 is generally not capable of hovering on one engine. U.S. Air Force variant for the U.S. Special Operations Command. It conducts long-range special operations missions, and is equipped with extra wing fuel tanks, and AN/APQ-186 terrain-following radar. The fuel capacity is increased by 588 gallons (2,230 L) with two inboard wing tanks; three auxiliary tanks (200 or 430 gal) can also be added in the cabin. U.S. Marine Corps variant. 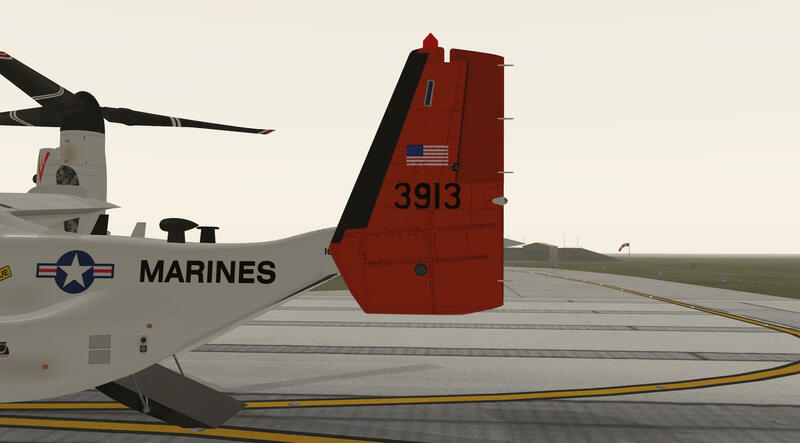 The Marine Corps is the lead service in the V-22’s development. 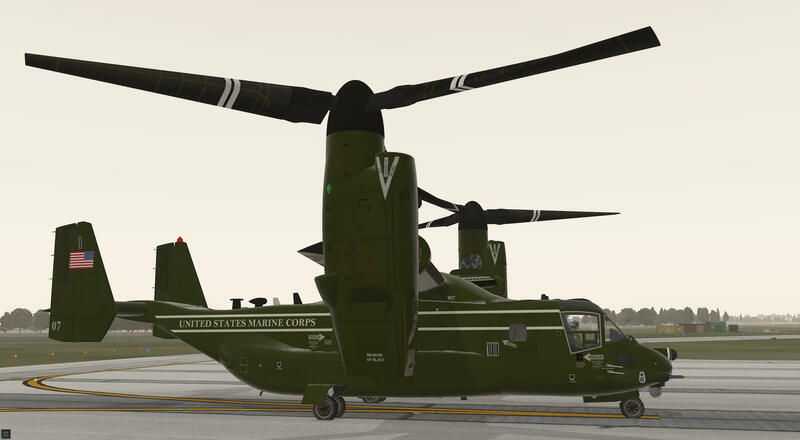 The Marine Corps variant is an assault transport for troops, equipment and supplies, capable of operating from ships or expeditionary airfields ashore. U.S. Navy variant for the carrier onboard delivery (COD) role. 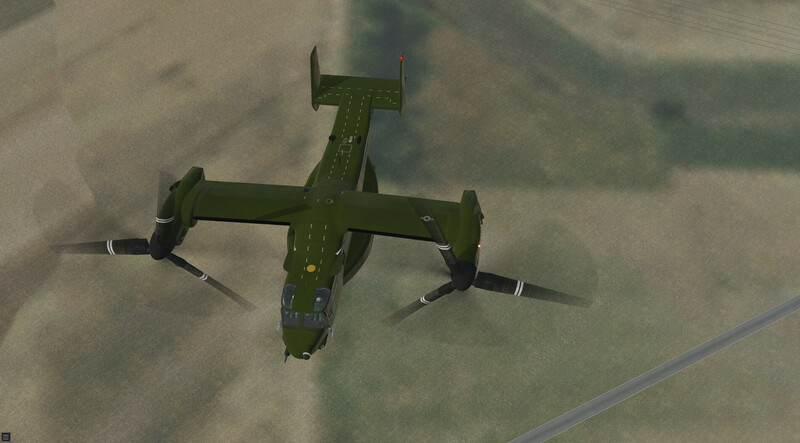 Similar to the MV-22B but includes an extended-range fuel system, a high-frequency radio, and a public address system. 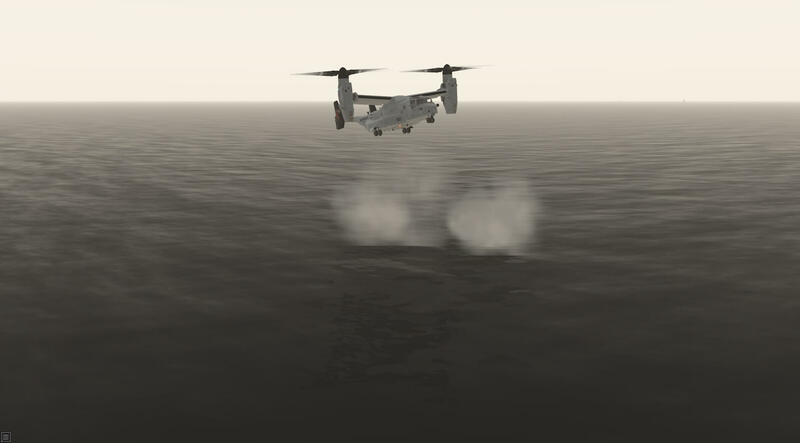 The V-22 Osprey has had nine hull-loss accidents with a total of 39 fatalities. During testing from 1991 to 2000, there were four crashes resulting in 30 fatalities. 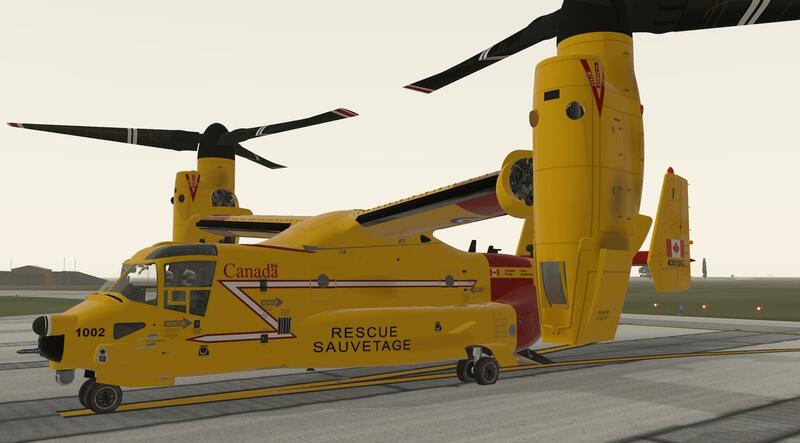 Since becoming operational in 2007, the V-22 has had five crashes resulting in nine fatalities, and several minor incidents. The aircraft’s accident history has generated some controversy over its perceived safety issues. A useful guidebook about the aircraft, development and use of the aircraft, published by Boeing, can be found at the following link. Download speeds will vary dependent on the internet connection but once downloaded the installation consists of copying the download in to the X-Plane aircraft folder. This is a straight forward process and works well. The present version at the time of this review is 1.2 dated 1st May 2018. The download includes 20 items one of which is the documents folder. This in turn holds five items. The first of these is a text document covering release notes and is a very useful briefing on the changes made to the model in the latest version. This tells those new to the aircraft what to expect and those updating what changes to look for. The second is a development folder with information on the fuel system and custom objects. The operation folder includes documents on the operation of the real aircraft and contains information on operating areas, launch and recovery patterns and control modes and the specs folder provides two specifications diagrams. All useful and interesting information allowing the user to replicate correct procedures and operations. The final item in the documents folder is the User Guide. The version in model 1.1 is r6 and the version in the 1.2 update is r5 but despite the numbering the latter is an update on the first and answers questions which I felt did need to be covered in the guide. The User Guide is written in a friendly and informative way and I recommend that the user takes time read and understand this, in conjunction with the release notes document. The document covers an introduction explaining the aircraft, ten pages covering diagrams and notes on consoles, panels and controls, checklists for ten different procedures, and a further eighteen pages covering procedures in detail. It is not the fault of the developers that I had to read this section several times, it is a very different aircraft and the pilot needs to understand what to expect and the routines to follow. I mention it should be read in conjunction with the release notes as there are a couple of things that have not yet been updated in the guide, for example the envelope in which autotilt operates and how it is displayed in the cockpit, but is explained in the notes document. The guide also includes advice on how to configure joystick/yoke/keyboard buttons to help with the operation of the aircraft and the ability, in X-Plane, to customise these settings for one aircraft is extremely helpful for this model as it operates so differently from other aircraft. There is also an explanation as to why some processes are automated in the model, as these would be actions carried out by other members of the crew in the real aircraft, and would add to an already considerable challenge if the user wanted to complete them in addition to what the real pilots do! This is a thoroughly useful document for anyone new to this aircraft and is also relevant for those updating from version 1.1 to version 1.2. AOA have tried very hard to make this a user friendly document to assist with the use of a model of a very unorthodox aircraft. Approaching the aircraft from the front, engines rotated to vertical, it is clearly unorthodox! The view into the cockpit is clear and whilst the glass has reflection effect the crew figures are well modelled. The crew uniform changes with the aircraft livery, of which there are eleven and the default grey. The colours for all liveries are bright and clear and the signage and labelling is crisp, legible and varied. The size of the proprotors is immediately striking. Having been close to an Osprey being prepared for flight this model delivers the same presence as the actual aircraft. The radome and refuelling probe are clear and well modelled. Travelling down the left side of the aircraft the views in to the cockpit via the side windows remain clear and detailed, radar and camera domes appear realistic and the front undercarriage is presented with a weathered effect on the wheel. Window glass maintains the reflection properties and the frames are modelled with rivets and fixings visible. Turning towards the wings panels and surfaces carry ridge detail and when viewed from ground level the engines and proprotors tower above the aircraft. Weathering from engines and use is apparent on the aircraft panels. The rotation mechanism for the engines is visible, through photographic modelling, and the proprotors themselves carry surface detail. Flaps are modelled in a slightly different colour from the wings and are therefore very visible. The main undercarriage is modelled and the wheels carry the similar worn look to the nose wheel. Moving back towards the rear of the aircraft the twin tails are modelled in detail with rivets and control surfaces visible. 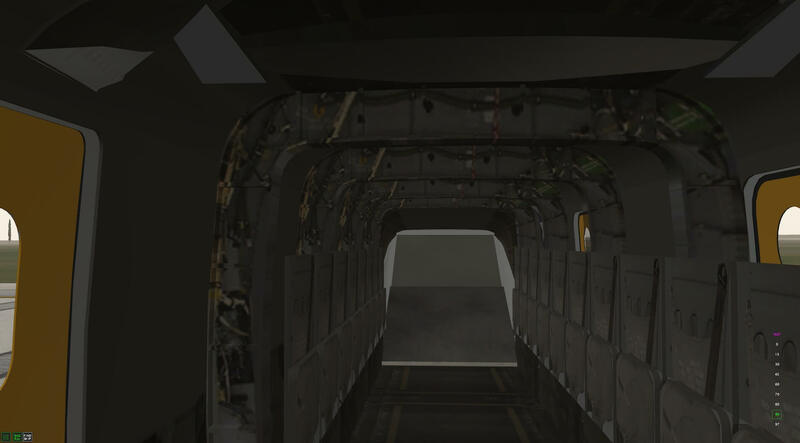 With the ramp down the cargo area of the aircraft can be seen from the outside and this is modelled to contain considerable detail. 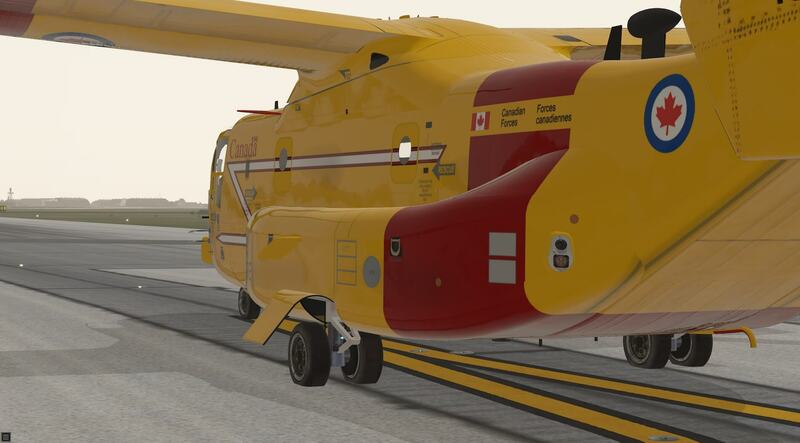 The same attention to detail continues on the right side of the aircraft and moving forward the front door can be opened and the steps also extend down. 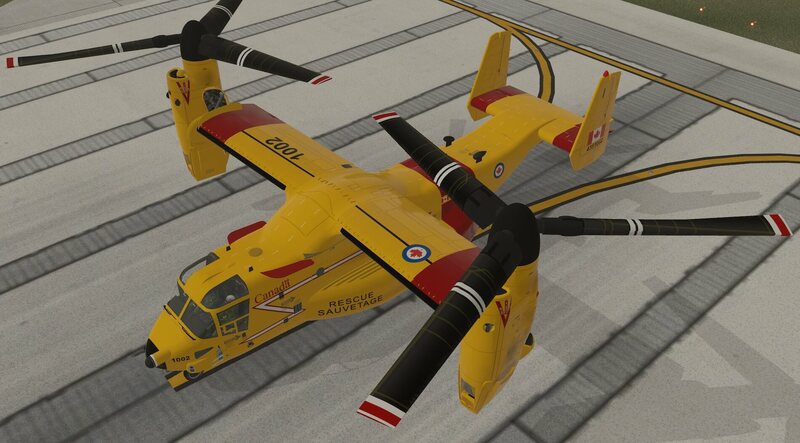 This adds further realism to the model and allows further views in to the aircraft. When viewed from above the aircraft panels and control surfaces are displayed in detail with light and shadow effects occurring as would be expected. When in flight the model maintains its integrity and colours and reflections and shadow all appear as would be expected. Views in to the cockpit, and the two crew figures, remains clear and detailed. Lights appear crisp and bright. The modelling of the proprotors is very impressive with a very good 3D effect and blade blur adding volume and realism. 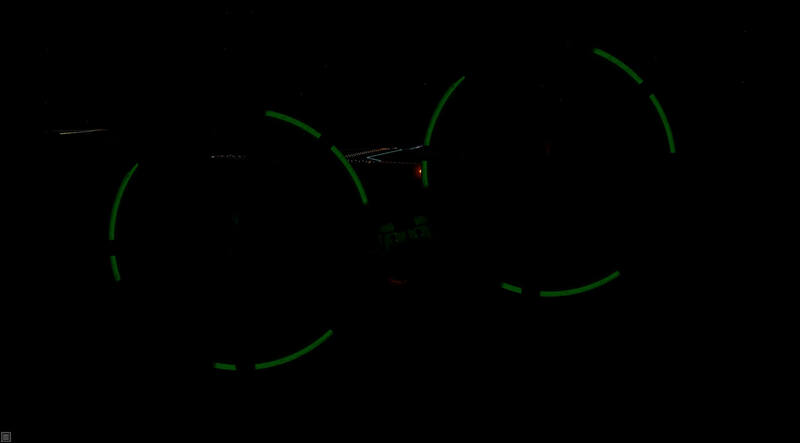 At night the proprotor arcs are lit giving the aircraft a UFO type appearance! 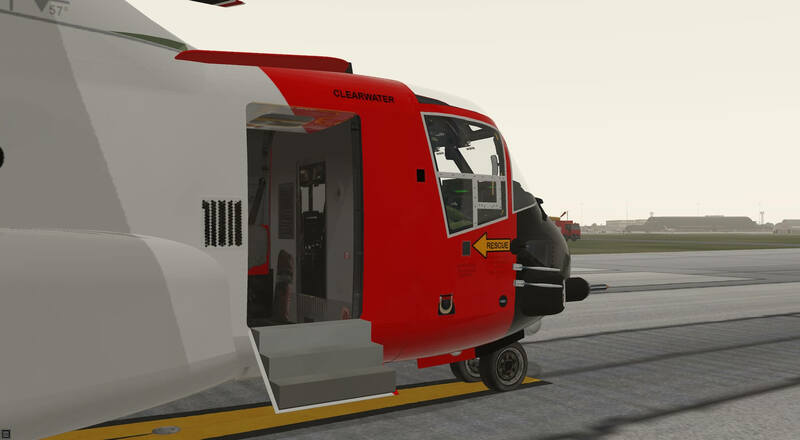 The developers have worked hard to ensure the detail of the aircraft exterior is accurate with radar, camera and communications equipment modelled in the same places as illustrated by photographs of the real aircraft on the internet. Some of the detail is provided by photographic representation but this does not detract from the overall appearance of the aircraft. 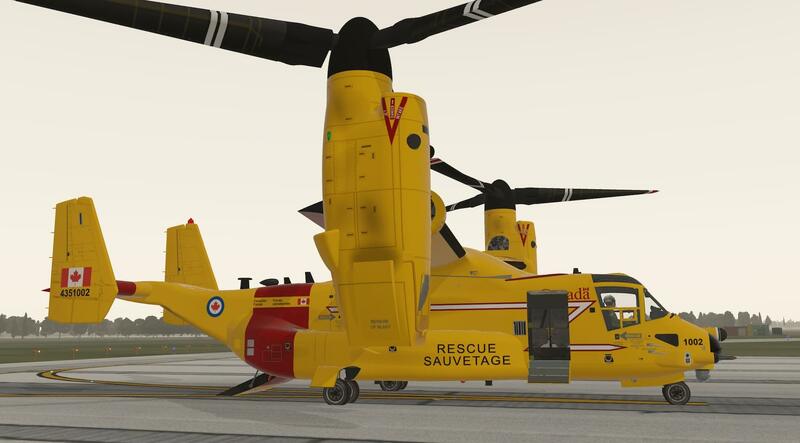 This creates a very realistic and convincing flight when viewed from outside the aircraft, not necessarily an easy task given how “different” this aircraft is. The interior of the cockpit has a modern feel and the flight instruments and glass cockpit are presented in detail through all front, side and overhead panels with standard analogue instrumentation also provided. Colours and lettering are bright and clear and many of the controls are modelled to be usable. 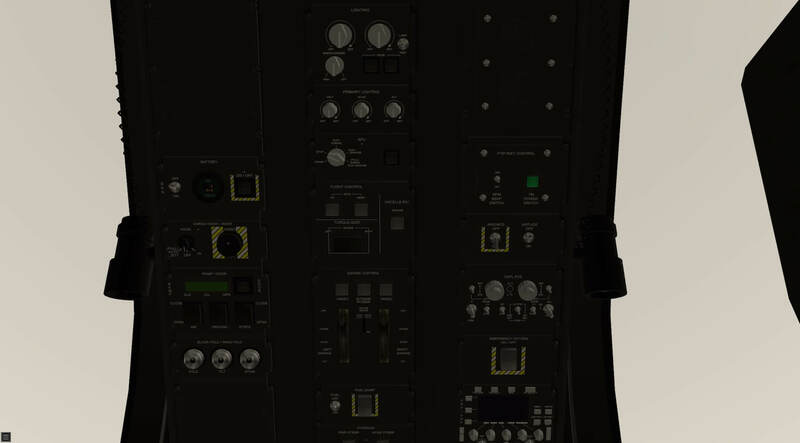 Some of those switches that control issues which are not usable in the simulator are displayed but not usable. Useful labelling of the instruments is provided when the cursor is hovered over a particular control. 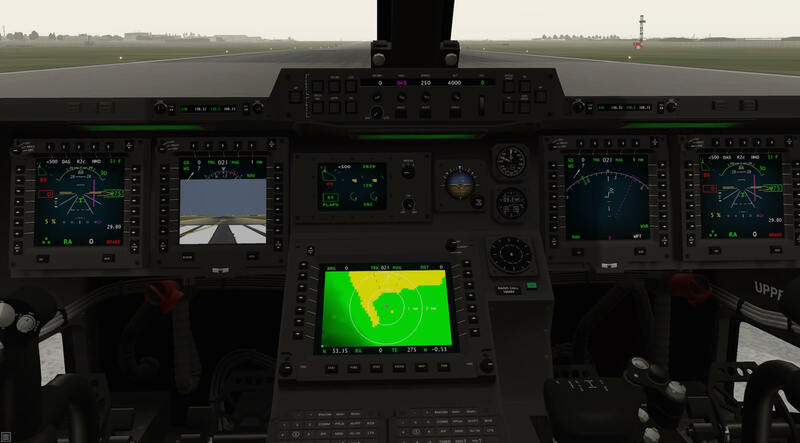 The DAS mode allows the user to move from the pilots seat, on the right in this aircraft, to the co-pilots seat and to the crew seat between them by clicking on an area of the windscreen frame. This allows quick movement throughout the cockpit and to view different controls. A camera view is available and shows the external view on the co-pilots display, thus not obscuring the pilots instruments, although the Documents folder text document does explain how to change settings so that when in use it is displayed in front of the pilot. All surfaces and textures appear realistic and have the military, practical feel about them. 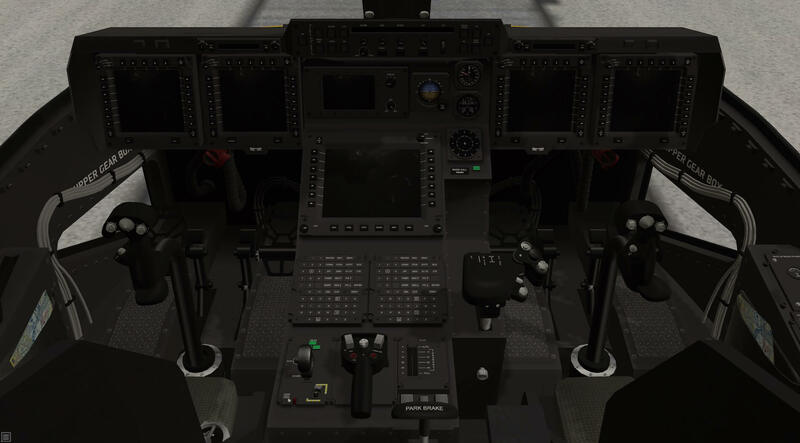 Lighting and shadow are modelled to add to the realism and views out of the cockpit are clear with various windows providing a view similar to that from the cockpit of a helicopter. The pilot and co-pilot have maps in the side pockets next to their seats. When clicked these helpfully provide the X-Plane map pop up. With the DAS view switched on turning to look over each shoulder or completely backwards changes views to external on each engine or the rear ramp respectively. Whilst it may be argued that this is not what the pilot would see the other members of the crew could put themselves in position to take these views and feed back to the pilot so this setting allows that feedback to be recreated in a very useful way. 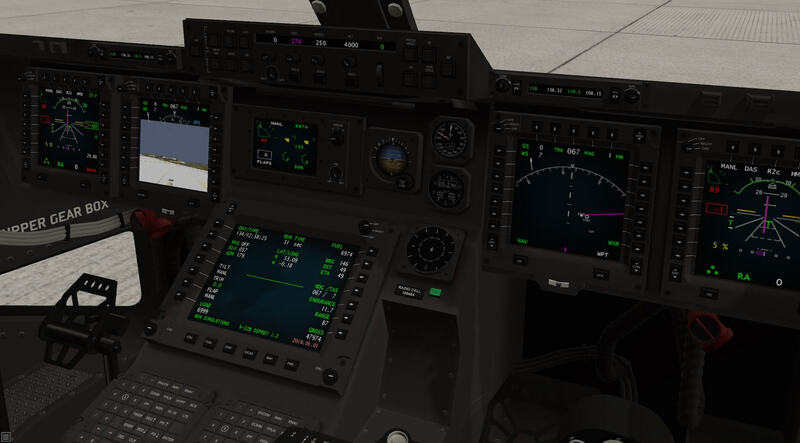 A small on screen menu allows for the different view options to be accessed quickly and also provides a useful scale to the right of the screen which displays the angle at which the engines are tilted. This also includes short cuts to toggle fuel on, rotor brake, and control the position of the engines, rotors, door, ramp and steps. Looking back in the cockpit the bulkhead door is modelled with the crew jump seat in the folded position. Wiring and conduits are modelled in detail, as are interior cockpit lights and printed warnings. Moving back through the bulkhead door the rear cargo compartment can be accessed. 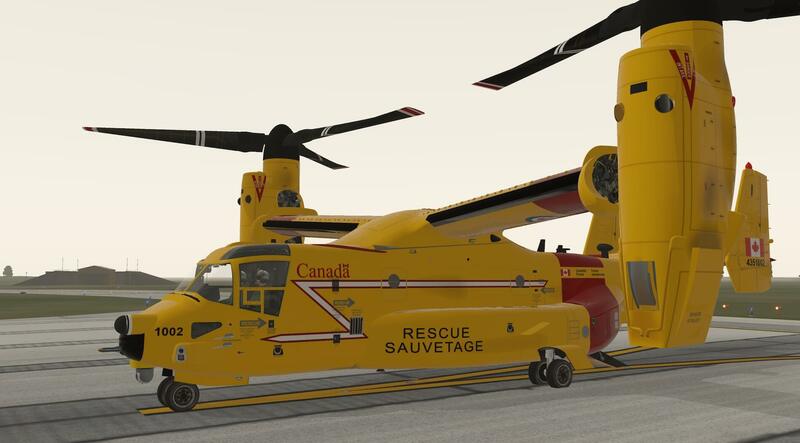 This is modelled in detail, again including some photographic representation, and includes folded seats for personnel transport. Views from the rear ramp and out of the windows are clear and realistic. 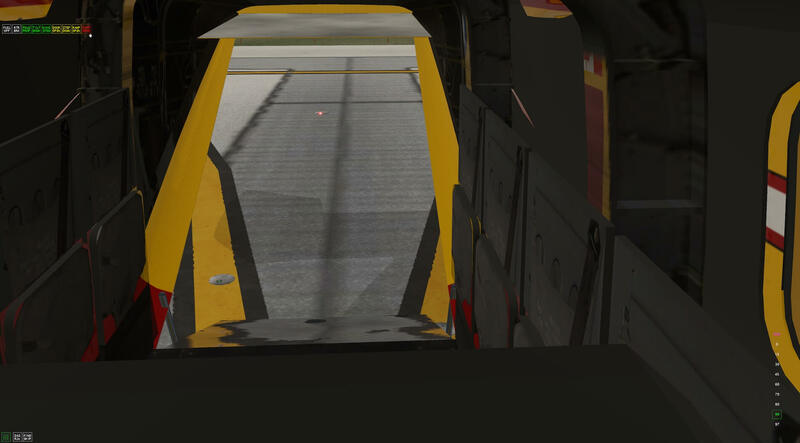 With the rear ramp open the interior is detailed and can be displayed with cargo in the hold. 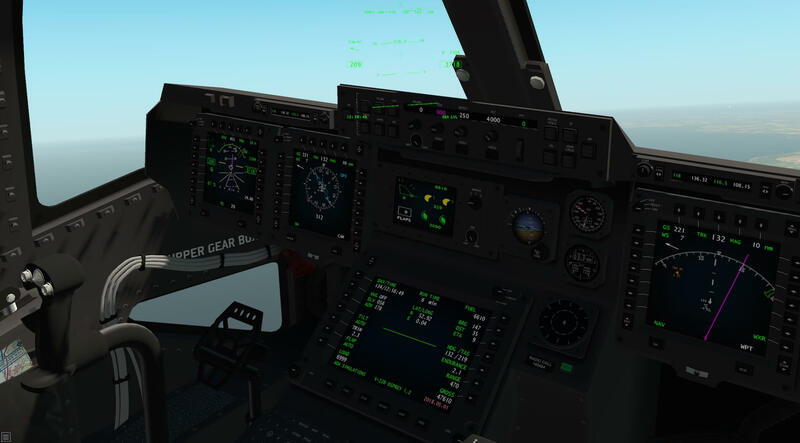 The interior of the aircraft is realistic and convincing with the flight controls displayed to a high standard. 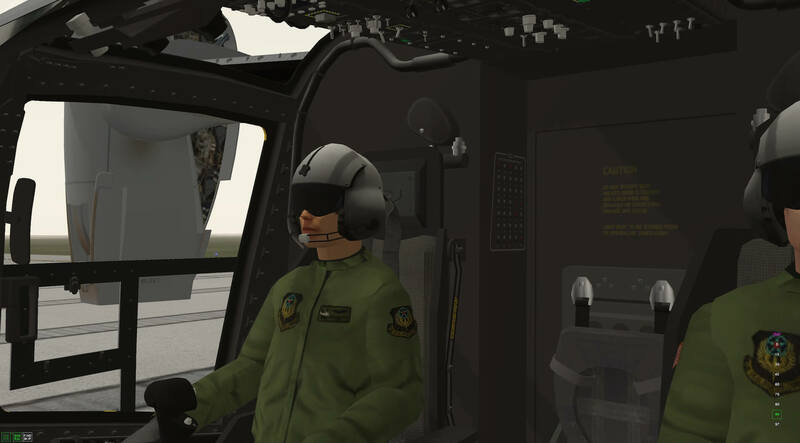 This all adds to the authenticity of the experience of using this aircraft with menus that assist the pilot to use the model to the full without being intrusive or reducing realism. The User Guide provided with the model gives good and clear information, instruction and advice regarding the various systems provided either to model those on the real aircraft or enable the user to use the simulation to the full. Whilst there are short cut menus to carry out various procedures the switches and levers to carry these out are modelled for use. The CDU is positioned between the two front seats and clicking on the keypad creates the familiar X-Plane pop up. This provides the route planning facility and is compatible with such route planners as Goodway. The route can also be displayed via the FMS page on the CDU screen. The CDU also presents information such as the current calendar day and local time, simulation run time, sun azimuth above (and below) the horizon and sun bearing from your position. It also presents your current latitude and longitude, true airspeed (TAS), heading and bearing, distance and estimated time of arrival (ETA) at a destination programmed into the FMS>GPS. Also displayed on the CDU are your current aircraft gross, fuel and load weights, all in pounds. The auto pilot panel is at the top centre of the instrument panel and includes the normal advanced features expected on a modern autopilot. The user guide includes the following information about the limitations created by the simulator: “ Autopilot flight control servos are non-functioning on this model because X-Plane/Plane- Maker looks at the Standard/Engine Specs/Location tab, sees the prop type = “VTOL cyclic” and applies helicopter flight control logic to the entire flight envelope, preventing the flight control servo actuators from controlling the aircraft. VTOL cyclic control logic is necessary to enable control of the aircraft in helicopter mode. Choosing any other available control option in Plane-Maker makes the model uncontrollable in the helicopter mode. The pilot and copilot each have two Primary Flight Displays with one providing flight and navigation information, including terrain and weather displays, and the other providing systems information. Each flight crew also has a radio nav/com panel. Between these displays in the central column is a small display screen containing information on nacelle tilt, elevator trim, flap settings and engine in formation. The PFDs also contain switches to enable DAS, R2C and the Head Mounted Display systems provided with the model. 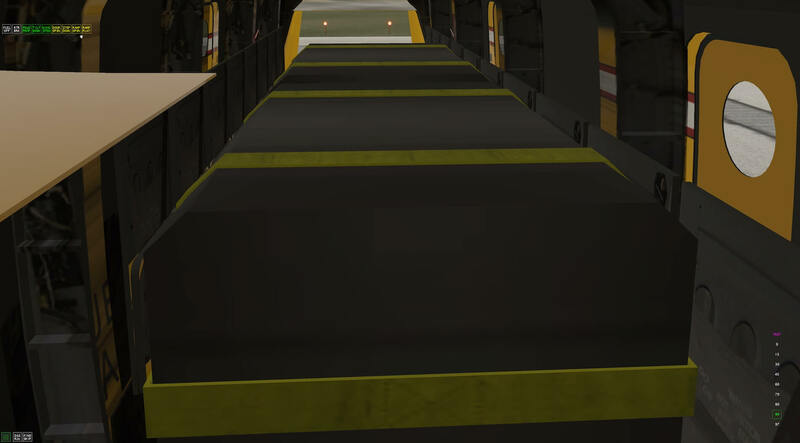 The model is designed to automatically close doors and ramps should you enter flight with these in the wrong position. Whilst the real aircraft does not have these facilities this is the part of the model, as mentioned before, where the designers have simulated input from other crew members who would be checking and closing these doors as part of their role. This is a useful and realistic addition that does not detract from the model and positively assists the user. The wheel brakes on the aircraft do not need to be switched off for vertical take off and automatically switch off when in flight. On the ground the model brakes can be controlled through movements of the stick as well as dedicated keyboard buttons. 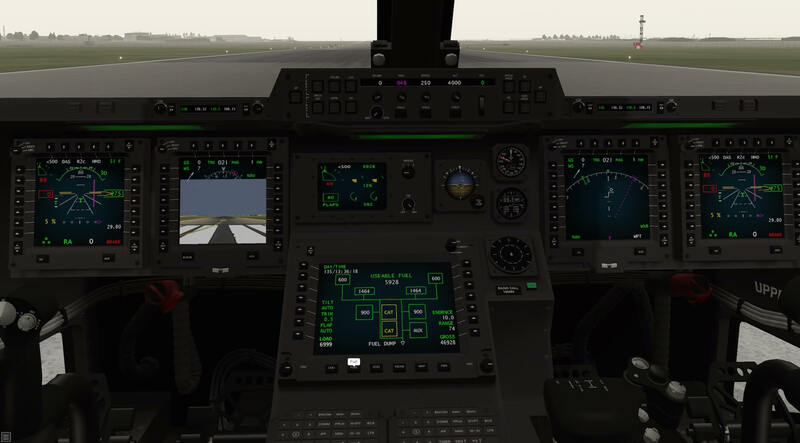 It worth using the X-Plane provision of dedicated stick and keyboard settings for different aircraft as this model has its own requirements and the User Guide recommends programming switches on the joystick, yoke or keyboard to control vector sweep aft and forward to set the nacelle tilt on the model. Whilst auto tilt is available it only takes place once certain criteria are met in flight as explained in the User Guide. Flaps and trim are usually controlled automatically though the aircraft systems do allow for a manual option. The developers have included a good luck message in the manual for those who want to try! Trim reverts to manual control in flight over 160 knots. 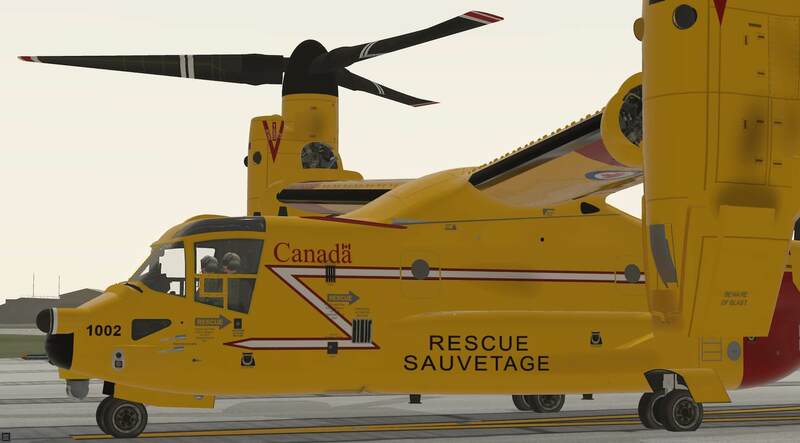 Undercarriage also retracts and extends automatically when the correct settings are put in place by the pilot though there is a manual option as they are not needed when operating from water, another capability of this amazing aircraft. The model includes refuelling options where, for in flight refuelling, the developers have created a flight envelope in which the aircraft should be flown with the probe extended and the model will be refuelled. On the ground the parking brake should be set and the refuelling probe extended for refuelling to take place and changing either of these settings will stop the process. This is a big aircraft and need to be stored on aircraft carriers and other vessels. The real aircraft provides the facility to fold the proprotors and wings to reduce the aircraft footprint and the model provides the same systems. This process can be completed either via the on screen menu provided or via the correct switches in the instrument panel. This is a great addition to the model and certainly adds to a greater understanding of its use. 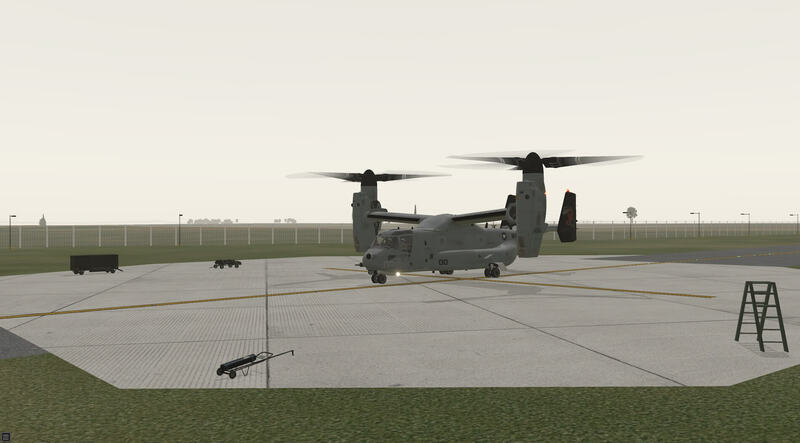 “This is relevant to our V-22 Osprey model. Adapted from the SASL target tracking code we developed for our F-35 model. Nothing to do with “real” MV-22B Osprey capability. Nothing to do with “guns” per se because there is no gun on our model. We are just using the weapons system gun MODE to segregate this feature from “normal” cockpit modes. Select DAS to ON. Switch is labeled DAS at the top, left of centre, of the pilot’s PFD (Primary Flight Display). Select HMD (Head Mounted Display or “HUD” if you prefer) to ON. Switch is labeled HMD at the top, right of centre, of the pilot’s PFD (Primary Flight Display). Use keyboard or HOTAS buttons (switches) to select weapon up one = gun. Then use keyboard or HOTAS buttons (switches) to select target up (or down) one. 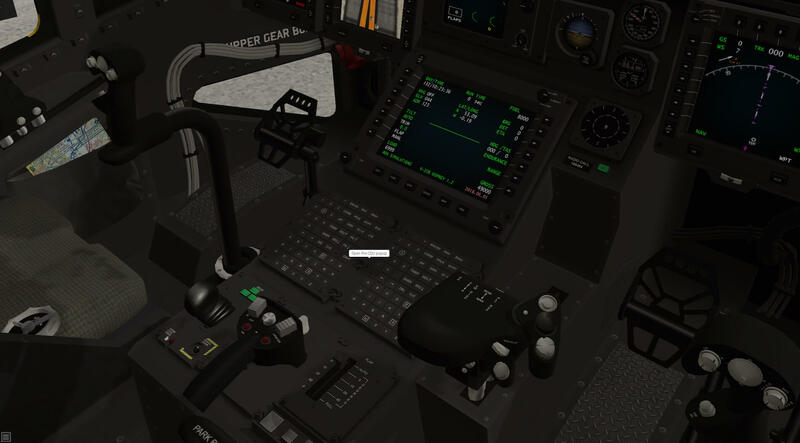 Select 3D cockpit model (use keyboard or HOTAS buttons (switches) to toggle 2D/3D cockpit modes). First important note: We did not create cockpit keys for 2D/3D cockpit mode toggle, weapons select or target select because, after you select gun mode, then target select the pilot camera is going to lock onto the AI planes location and follow it around. That AI plane may be directly in front of you, in which case you would have access to a 3D cockpit located ON/OFF switch. OR, the AI plane may be off to one side or behind you aircraft, in which case you would not be able access those switches and would have to manoeuvre your plane around to face the AI plane to access those cockpit switches again. Better to program your keyboard or HOTAS for those functions. target selected and 6. 3D cockpit mode selected. If you get the first five right and the last one wrong, meaning you are still in 2D cockpit mode the system will not work. Your cockpit view will remain locked looking forward. This is a good thing though, because it means that the only thing you need to do to enable the whole system to function is toggle from 2D to 3D cockpit modes. As soon as you do that the pilot camera will track the AI plane. It also means that, at ANY TIME, YOU CAN GET A FORWARD COCKPIT VIEW BY TOGGLING BACK TO 2D COCKPIT MODE! The R2C system automatically looks in the direction of banked turns and helps when flying without a head pointing device. This only works when in 3D cockpit mode. It works well and creates a more natural view when turning. 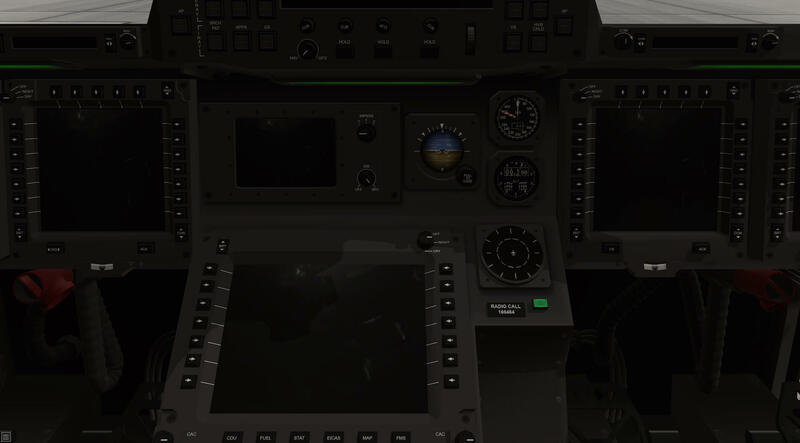 In the small on screen menu there is “find ship” button that locks the pilot view on the X-Plane carrier and stays focussed on it whilst you fly the aircraft. 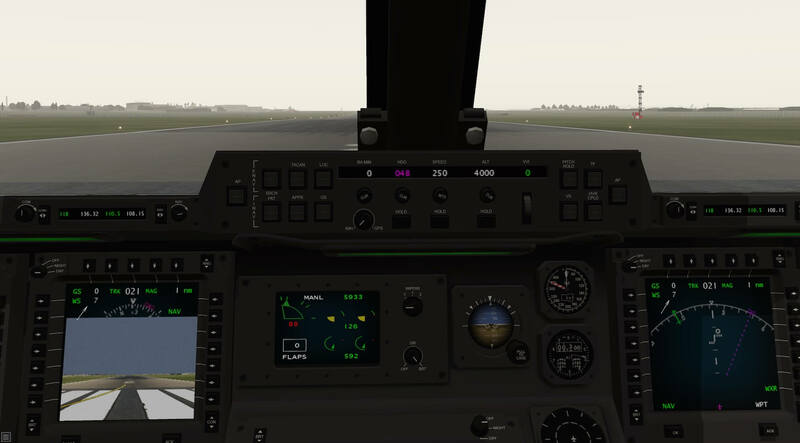 The developers have tried to create as many different view options a spossible and this allows full use of a cockpit designed for all round visibility. Each view mode allows some movements and view controls and inhibits others. It is easy to change the view mode quickly but the user needs to remember the mode being used so as to use the appropriate controls at the right time. 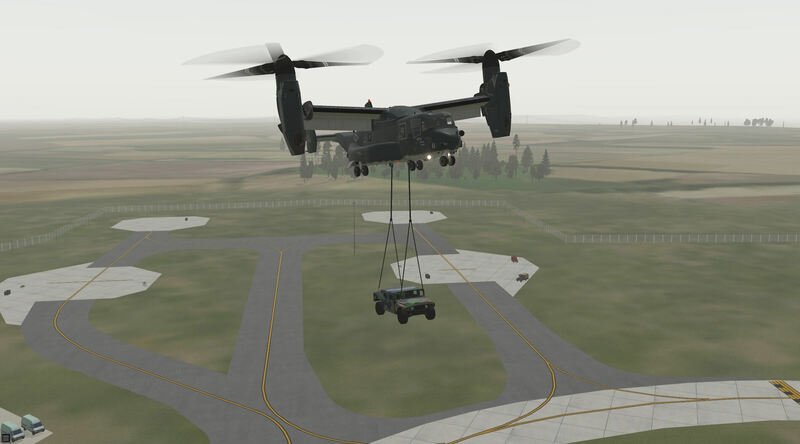 One system that appears to have been removed from the V1.2 User Guide but is still available is the ability to carry a Humvee load underneath the aircraft. Start a new flight on the ground. Press SHIFT-C: two hooks will appear below the Osprey. Take-off and climb gently. At 30 ft radar alt, you will hear a “thirty” voice annunciation and the Humvee will be attached. The display informed the pilots that the hooks are extended and when the Humvee is attached. Press SHIFT-C again to hide the payload. The model provides sounds for the use of switches and levers and also warning alarms. These are standard sounds and do provide audible confirmation of actions taken. When starting from dark and cold the checklist is supported by confirmation of actions such as the APU starting and then winding down when switched off. In flight most sounds are limited as the overriding noise is that of the proprotors whether inside or outside of the aircraft. The thump of the rotors and the volume of the engines increases appropriately with changes in throttle settings and once at powered flight it is difficult to hear much else. This is totally realistic and not a criticism of the model. The engine and proprotor sounds are important in flight as the User Guide encourages the pilot to become accustomed to their tone and volume to assist with controlling the aircraft as a driver in a car would when knowing when to change gear in a car. The undercarriage makes a reassuring thump when retracted or extended. 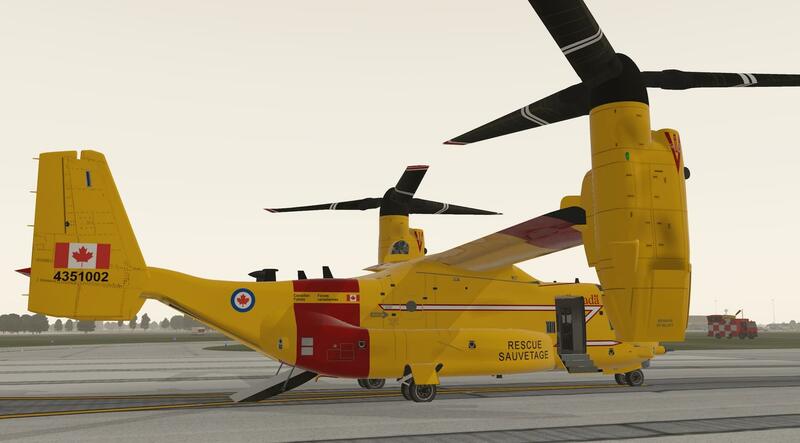 The model has a good and practical sound package which adds to the realism of the aircraft and also helps with the flying process through confirmation of actions and change of engine and proprotor tones. I would urge any pilot to read the User Guide even before attempting a take off of any sort as this explains how to utilise all the auto features of the aircraft and initially, due to the unconventional nature of the aircraft, any attempt at flight would be extremely challenging without employing these automatic systems. 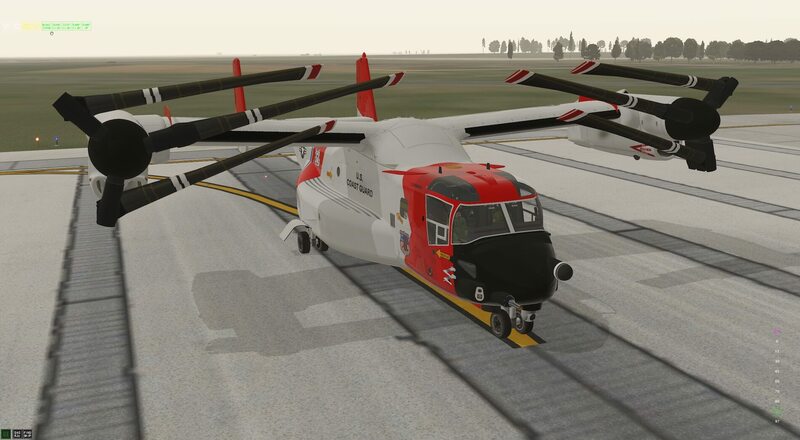 When loading the aircraft I found that it was not aligned quite correctly for the initial few seconds but the model took a little skip and all was then correct to start. The User Guide encourages that at first take offs are used to practice taking off vertically and staying in the hover over the spot where the take off took place. I found the this to be a real challenge initially but after practice this became more straight forward. I found it quite addictive to try to improve on my previous take off and maintain a steady hover. I was also very glad of the automatic systems on the aircraft and the pilot needs to ensure these are active before attempting a take off. Still without going through all the correct procedures I then moved on to the transition from helicopter mode to aeroplane mode. This means meeting various criteria outlined in the guide in relation to altitude, rate of climb and ground speed. Again this was challenging and I found that initially the auto tilt started to move the nacelles forward and then I missed the criteria and the nacelles moved to vertical again. This was no fault of the model just the pilot needed more practice. Having sorted that transition I practiced flight and then the transition back to helicopter mode. Again this was challenging as there were more criteria to meet but after practice this became easier. The instrumentation also indicates wind direction and strength so if the user has weather settings in place vertical flight has a further issue to deal with. I did try to use the two approach settings in X Plane to practice approach, transition and landing. The 3NM distance loaded the aircraft below auto tilt altitude and I found I could not configure the aircraft quickly enough before meeting the ground in an uncontrolled manner. The 10NM approach allowed time to set up the aircraft and then carry out the necessary procedures and criteria. Flying the model is a challenging but enjoyable experience and its combination of helicopter and aeroplane modes provides many different things to learn and in which to achieve proficiency. The developers have tried to assist in this with helpful notes in the User Guide. Moving on to cold and dark start the User Guide provides check lists for the procedure and also notes next to the instrumentation diagrams showing the location of the next action to take in the list. This a short list to follow, in line with many military aircraft, and the diagrams make the process straight forward. The checklists remind the pilot to check ramps and doors before take off and then reiterate the criteria to be met for a vertical take off with the systems automated. This process takes considerable practice but once learnt the take off and transition to aeroplane mode can be made very smooth. I had loaded a short flight in to the FMS and the maps and displays all functioned as expected and the desired track, distance and route was shown. If the aircraft departed the intended track an additional line was displayed showing the heading to be taken to meet the route again. This is very useful given that the autopilot can be switched on but as described before the system does not actually work, due to simulator restrictions, so the model has to be hand flown. The element that does function once the autopilot is switched on is the auto-throttle so the system maintains aircraft speed. This is helpful in allowing the pilot to concentrate on other issues during the flight. This ability to control speed is also very helpful when meeting the criteria for autotilt and for refuelling. Hand flying was straight forward and it is worth noting that the User Guide talks of not over controlling the aircraft and this is very true. I found very little input was required in pitch and roll to make any changes and it took me some time to correctly pitch trim manually. Practice resolved this and the aircraft was great to fly. The User Guide also speaks of anticipating the next manoeuvre so as to be in a position to make it, and also to give the aircraft opportunity to respond to bigger changes, and I found this to be good advice which I used more and more as the basic procedures became more familiar. 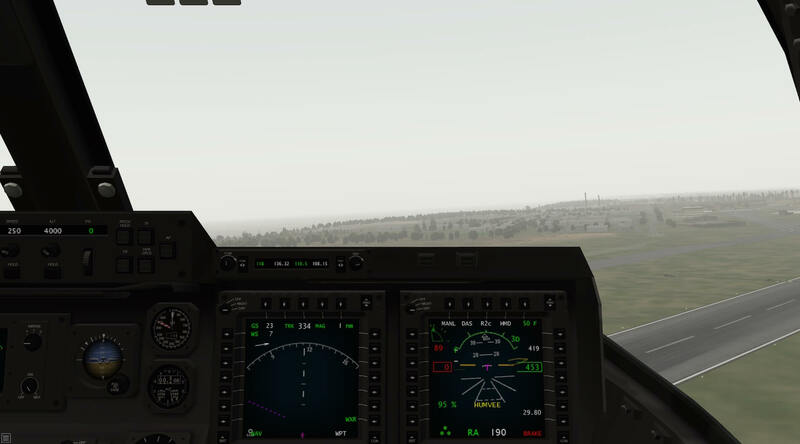 This anticipation is very helpful when transitioning back to helicopter mode as the criteria for autotilt have to be met prior to and during approach and I found it was easy to treat this as a conventional aircraft and approach too quickly. 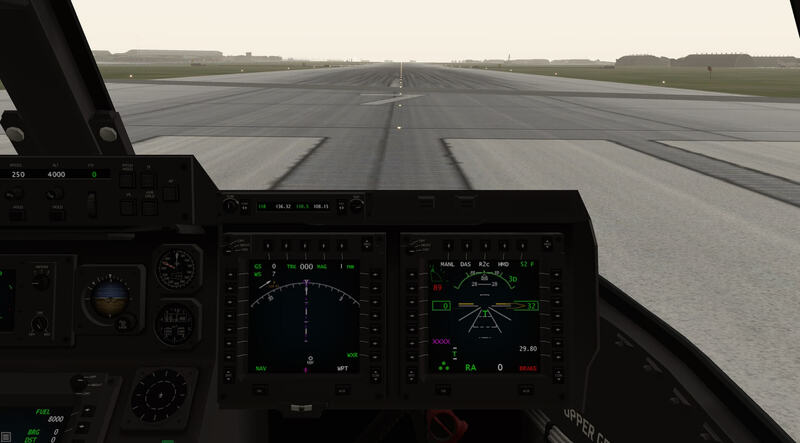 Again practice helped this process and the transition became less challenging the more times I tried to do it and once I completed it I used power changes to control descent and landing as described in the User Guide. I followed the shut down process in the checklists and this was easy to do. The ability of the model to demonstrate proprotor folding and wing stowing creates a real closure to the flight. This can be carried out via the on screen menu or by the correct modelled switches in the instrument panel. Completing the flight gave a great sense of achievement. Having completed the basic flight I used the User Guide to initiate the other procedures that the model is capable of. Refuelling on the ground is a matter of extending the refuelling probe and ensuring the aircraft weight is on the wheels and during flight it is a matter of meeting airspeed criteria with the probe extended. Both worked very well and when the display is in fuel mode the fuel on board can be seen to increase accordingly. In relation to the tracking in DAS mode I followed the guidance given to me in the forum and outlined earlier in the review. 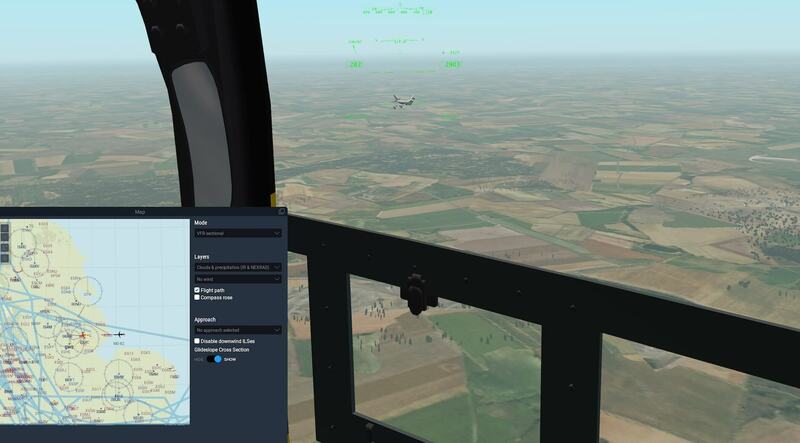 The system works well and takes the pilots view towards other AI aircraft. The screen shot below shows the view out of the cockpit with the B747 being followed by the tracker. I flew the two aircraft as close together to demonstrate the system. The tracker is great to avoid air collisions and also helps greatly when flying with other aircraft. The advice I received stated that buttons for controlling the system were not modelled in the cockpit itself as once the view is controlled the pilot may not be looking towards the instrument panel as in the screen shot. I programmed buttons on the joystick to control weapon up and down and target up and down. This made operation logical and easy to follow. It is well worth programming a button to change to 2D view as this quickly releases the pilots view back to the conventional approach and once 3D is restarted the view remains in the cockpit. The “Find Ship” button in the on screen menu is similar in that it keeps the pilots view on the aircraft carrier when carrying out a deck landing. The aircraft is also capable of Short Take Off and Landing and water landings. I tried both and found them both an enjoyable experience. I started at the end of the run way and controlled tilt manually, keeping the nacelles at 45 degrees. The take off worked very well and it was indeed a short run. Once airborne transition to aeroplane mode was easier than that after a vertical take off. 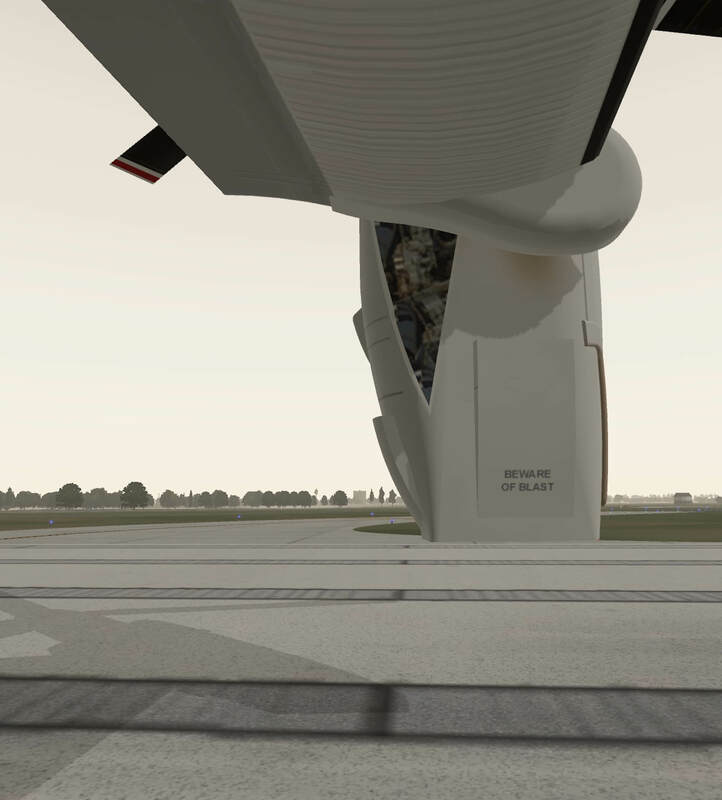 The landing felt like a conventional aircraft and it was interesting comparing the effect on the landing process as the nacelles are set at different angles. Landing on water has to be done with autotilt off as otherwise the undercarriage will automatically extend and I found it had its own challenges as it was more difficult to visually judge distance to the water surface than towards surfaces on land where other objects create perspective. 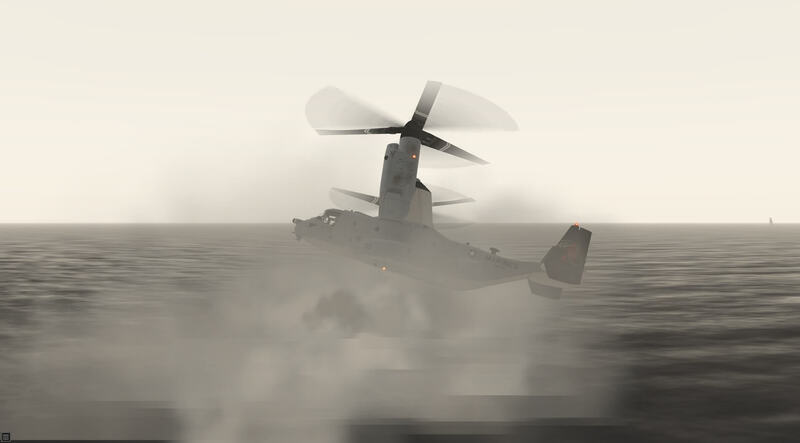 The model interacts with the scenery and the rotors create water spray during landing. This unconventional aircraft was never going to be simple to fly and new techniques and approaches have to be learnt for even the most basic of flights. AOA have included many different ways to vary the experience and carry out the capabilities of the real aircraft and this creates very addictive flying in that I wanted to become proficient at each stage of the process and yet also wanted to try the different aspects of the model. This model takes a lot of concentration but it is certainly worth it. I would like to compliment the developers on the User Guide for this model. It is written in a helpful way and covers all of the main points required to fly the model and goes in to some of the aspects in greater detail. It is helpful both to a beginner and a more experienced user. 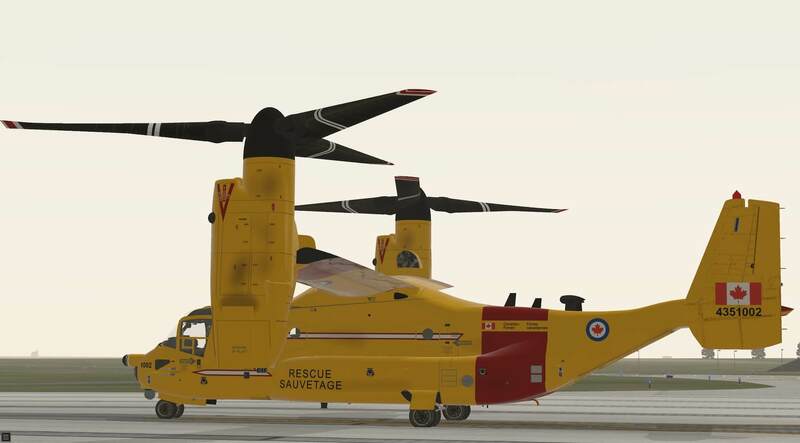 I am always impressed with the approach of developers in trying to push the boundaries of what is possible in simulation and using innovation to recreate capabilities in a model that reflect the real thing. 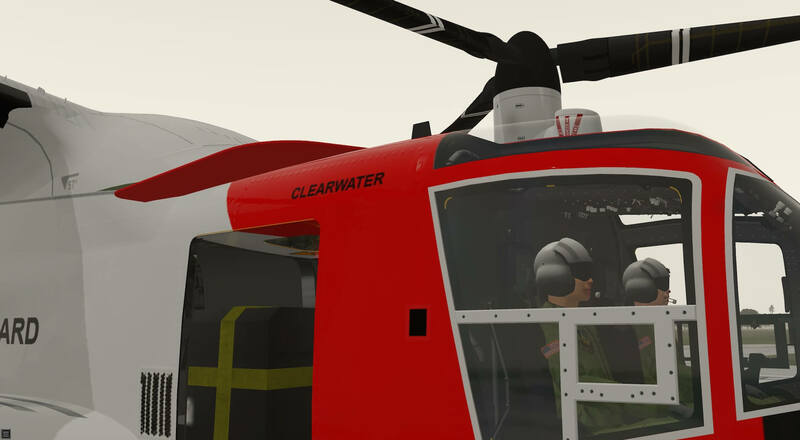 This aircraft is no exception to this and AOA have created a high quality model of an unconventional aircraft within the constraints of a flight simulator. The detail both inside and out is of a high standard and this compliments the flight experience which has been made to reproduce the unusual and demanding aspects of the Osprey. 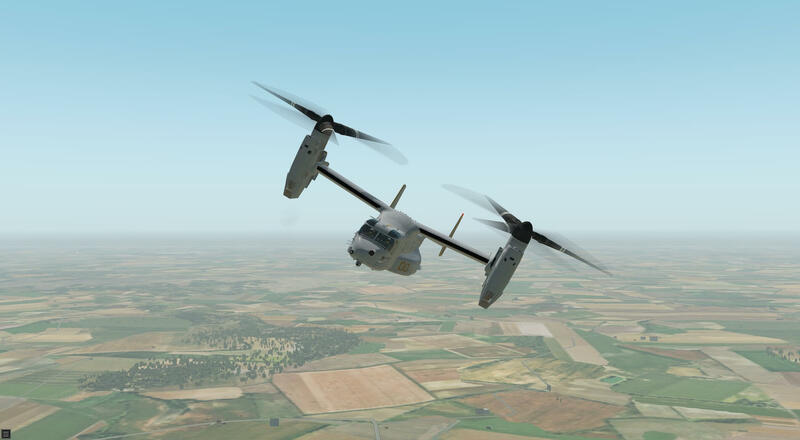 They have not shied away from the challenges of recreating the unique behaviours of this aircraft and therefore the user has the opportunity to experience the levels of concentration and skills required to operate the V22. A great model with a large variety of challenges available to the user creating an enjoyable and, indeed, addictive experience.